Many homeowners dedicate a space in their den, family room or man cave in the basement to display their favorite sports team’s memorabilia. Why not extend the love to the bathroom, too? 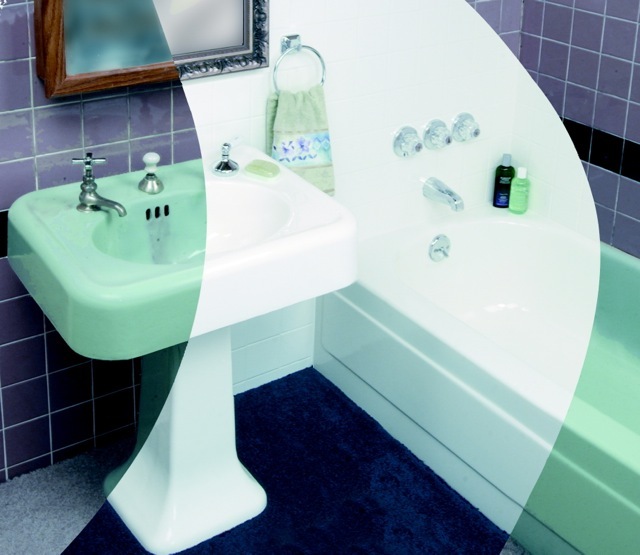 One of the many benefits of surface refinishing is changing the colors of your existing bathtub, sink, vanity and tile, and it happens to be one of Miracle Method’s specialties! 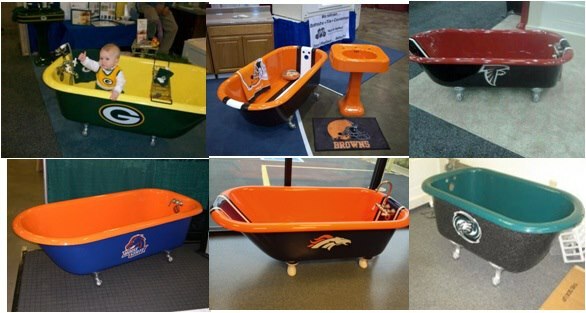 While most of our customers tend to select traditional colors, we do have some who choose to outfit a bathroom in the colors of their favorite team, be it college, NFL football, or major league baseball! With a variety of colors to choose from and the ability to match most any existing color or to create a custom color, Miracle Method can help make your design for a fun and festive bathroom a reality . Your home will quickly become the place to be on Super Bowl Sunday! Whether you want to create a sports-themed bathroom or update the look of your tub, tile, shower or vanity, surface refinishing from Miracle Method can help. Visit our website to learn more about our services. You can give us a call at 855-212-7337 or use our online locator to connect with a franchise near you. Please note: Logos must be purchased separately. Does Miracle Method provide a warranty on refinished bathtubs? While new bathtub manufacturers, like Kohler and American Standard, offer only one year warranties against manufacturer defects. Each Miracle Method provides a warranty on bathtubs, wall tile, counters and fiberglass fixtures against failure of adhesion of the applied finish for a period of five years for *residential use and one year for commercial use. 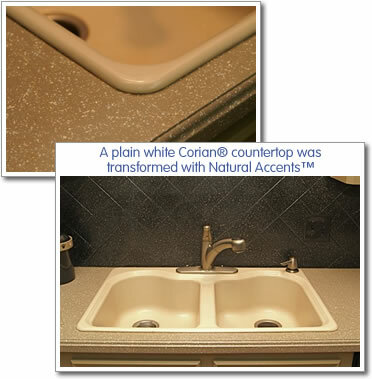 Sinks, floors, spot repairs, slip resistant surfaces and other refinished surfaces are warranted for a period of one year against failure of adhesion of the applied finish. This limited warranty is provided by your local franchise that performed the work and is subject to any other conditions stated on the front of the invoice. For items such as Easy Step®, grab bars, or shower doors, only the installation is warranted for a period of one year. Any product warranty is provided by the manufacturer. In the event of any failure of adhesion covered under this warranty, the local Miracle Method franchise will repair the failed area. Color of reapplied finish may vary with time and conditions. Caulk, rust stains, plumbing, reoccurring rust, mildew and mold are not warranted. Any warranty claim must be submitted to and verified by the independent franchisee that performed the work. Travel charges may apply. The franchisor of Miracle Method makes no warranty, either direct or implied, for any job. *Residential is defined as the owner/occupant of a single-family residence. Miracle Method’s refinishing process is an affordable and beautiful alternative to replacement, adding years to the useful life of bathroom fixture surfaces, while providing unlimited color and decorating options. Each Miracle Method skilled craftsmen uses only the best materials and takes pride in their work. That’s something you won’t find with a DIY kit or another cheap fix. If you would like to learn more about how Miracle Method’s process, please visit our website, www.miraclemethod.com, or call 855-212-7337 to reach the nearest Miracle Method office. We can’t find a matching tile after plumbing repairs. Do I have to retile the entire surround? Unfortunately, tiles are often broken during plumbing repairs of tub faucets and when that tile is no long available, you’re faced with the potential of replacing the entire tile surround. Mismatched tile is not exactly a designer look and replacing all the tile can be expensive and you’ll be doing without the bathtub for about a week, not to mention the messy demolition. You’ve heard of surface refinishing and start to search for a company that can repair and refinish tile. Your search leads you to the Miracle Method Surface Refinishing website, where you learn that for a fraction of the cost of replacing the tile surround, Miracle Method will refinish the tile to look like new. 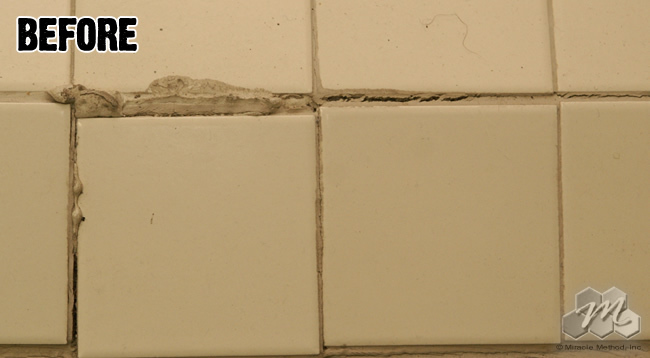 As long as we have a replacement tile of the same size and texture, it’s a simple fix. The new tile is put in place and grouted. 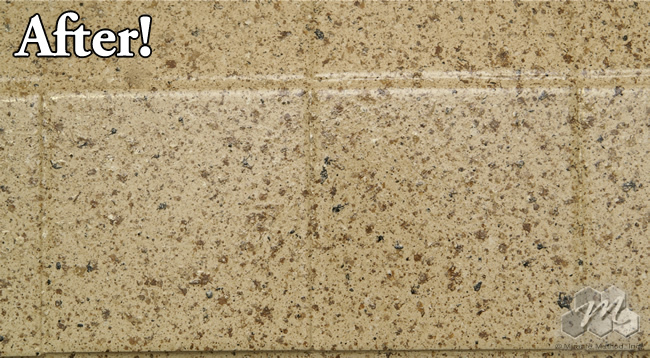 Once done, the entire surround is refinished in your choice of colors, including one of our Natural Accents™ stone finishes that will give your tile that upgraded makeover look. Refinishing typically saves 75% over the cost of replacing and most work can be completed in two days or less. Before: Tiles are damaged and in need of repair. After: Repair and refinishing by Miracle Method leaves the tile surface looking like new! To learn more about how Miracle Method can save you money on tile repair, call 888 902-0515 or use our online locator to find a franchise near you. You’ll love the new look and the money you’ll save. Do DIY tub painting kits really work? Many people purchase homes that are less than perfect with the thought of fixing it up. That fix up usually includes a bathroom with out of date colors on the bathtub and tile. You can only stand a green, pink or yellow tub and tile so long, but tear out and replacement is expensive. DIY tub and tile refinishing kits sold in Home Depot or Lowe’s appear to be a solution, but you need to think this through before your open that box and use it. Ask yourself…Would you repaint your own car? Refinishing involves many of the same skills and materials used by professional auto body craftsmen. When you consider that 25% of all work performed by Miracle Method is redoing someone’s attempt to refinish a bathtub, you should think twice before using a DIY bathtub refinishing kit on your bathtub. Additionally, using a DIY kit will usually only camouflage the problem or fail to adhere – causing you to spend more time and money on a solution. 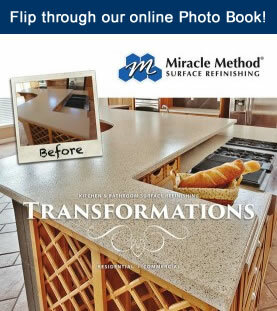 An affordable alternative is to have the professionals from your local Miracle Method Surface Refinishing franchise refinish your tub to a like-new look and feel. Our process includes many steps that are not in a DIY kit, such as removing the old caulk, a thorough cleaning of the tub’s surface; the application of our MM-4 bonding agent, which will ensure the new coating will endure; porcelain chip repair if necessary; several coats of our high tech acrylic urethane to make the surface event; buffing and polishing to create a high gloss shine that will resemble new porcelain and application of new caulk. Best of all, our process is completed in two days or less and is with savings of up to 75% over the cost of replacement. 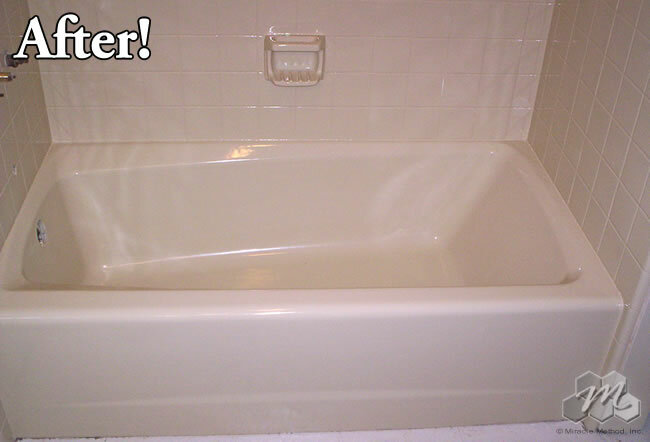 After: The tub and tile are bright and look like new! 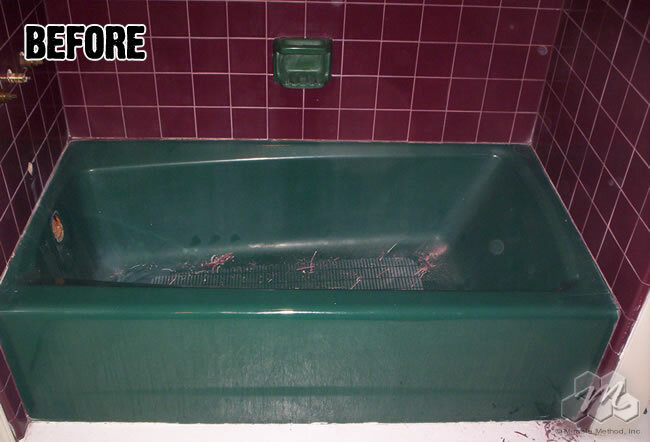 Before you buy a DIY bathtub refinishing or reglazing kit, visit the Miracle Method website or contact your local Miracle Method office by calling 855-212-7337 and ask for a free estimate to refinish your bathtub and tile. Click here to use our online locator.